Danish jewellery company Pandora used Facebook’s automatic placement options to create a Christmas video ad series that lifted online sales by over 60%. Founded in Denmark in 1982, Pandora is a hugely successful jewellery brand known for its beautiful charms, necklaces, bracelets and earrings. Pandora sells its jewellery online and in stores worldwide. 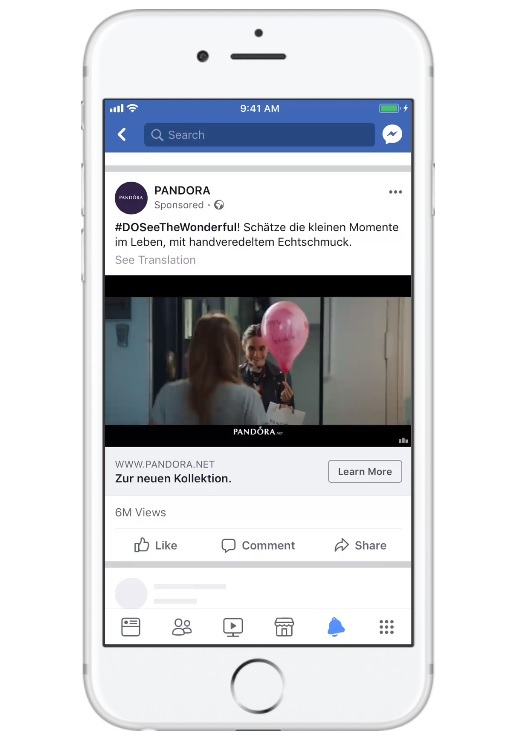 Pandora wanted to use high-quality video to generate positive sentiment amongst German audiences during the Christmas shopping period, and use Facebook automatic placement to increase video view rates for the campaign. Pandora knew that its direct response campaigns on Facebook drive online sales. The company wanted to test whether a brand campaign using videos could have the same impact on its ecommerce business, while also building the Pandora brand. Pandora also wanted to learn how ad frequency affected its Facebook campaigns, and to compare in-stream video ads (video ads that play during a video from another provider on the platform) to videos running in Facebook News Feed. To measure the effectiveness of its Facebook ads, Pandora chose a Germany-wide campaign that ran on TV, print, outdoor and other media. Pandora’s global creative team worked closely with Facebook to adapt the campaign TV ad, cutting it down to 15 seconds and reformatting it into a 16:9 rectangle, and 1:1 square ratio to suit mobile screens. Pandora then ran the video ad on Facebook, targeted to people in Germany aged 18–50. Pandora took advantage of Facebook’s automatic placement to guarantee the most efficient in-stream and News Feed placements on Facebook and, in some cases, Audience Network. The campaign generated an unprecedented view-through rate on in-stream video, while also lifting brand sentiment and favourability during a key period. Lioba Licht, Head of Brand Marketing Northern Europe, PANDORA, said: “We already knew Facebook’s direct response solution drove sales to our e-store, but we were keen to better understand how we could also improve our brand awareness. Together with Facebook and our media agency eSome, we decided to try brand videos in the new in-stream placement. The test demonstrated how brand video and direct response achieved more together than separately."